The St. Regis Bora Bora will launch an all-new "Extreme Adrenaline Adventure” package this spring, offering resort guests the chance to partake in a day of activities sure to spike the adrenaline. The package includes snorkeling with sharks and rays, a fast-paced jet ski tour around Bora Bora, and a choice of parasailing or skydiving followed by dinner at Lagoon Restaurant. The package is available from April 1, 2017 and pricing starts at $1,775 per couple. Guests are whisked away from the comfort of the resort on a handmade pirogue, a small wooden canoe, captained by a local Polynesian expert. The adventure will include various stops to snorkel with eagle rays and sharks. FAST-PACED JET SKI TOURFollowing the shark and ray encounter, adventurers will embark on a jet ski tour around the island at racing speed. A local guide will uncover special spots throughout the island tour, and make a stop in shallow water to take a break complete with a fresh fruit snack. PARASAILING or SKYDIVINGParticipants choose between parasailing and skydiving as the final component of the “Extreme Adrenaline Adventure” package and perhaps the most exhilarating. Daredevils will soar high above the breathtaking Bora Bora lagoon and Mount Otemanu, catching the best views from hundreds of feet up in the sky. 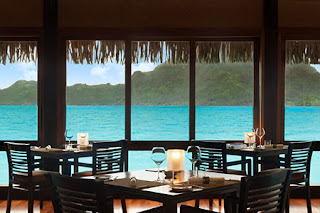 Following an exhilarating day of heart-pumping activities, guests can unwind with dinner at Lagoon Restaurant by Jean-Georges, the St. Regis Bora Bora Resort’s exclusive signature restaurant. Considered by many as Bora Bora’s top dining experience, guests can choose from a dinner menu that includes the popular Uravena fish. Lagoon Restaurant is the only restaurant in French Polynesia to offer this fish because of the extreme difficulty of preparation. Offering the most exclusive island accommodations in the region, this sprawling 44-acre resort matches blissful Polynesian paradise with flawless signature service. The 90-room resort consists of private land villas and private overwater villas perched upon the beautiful turquoise waters of the South Pacific. Visitors are consumed by views of Mount Otemanu, in addition to the white sand beaches and crystal clear water, both spanning for miles. The St. Regis Bora Bora Resort encourages guests to make the most of their stay in Bora Bora with hotel offerings and activities to accommodate every traveler type - from swimming with sharks and stingrays, to romantic boat cruises.